Visit Management Awards for online application and details such as eligibility,categories and prizes. Earlier, on 21st October, Prime Minister Shri Narendra Modi had spoken about the need to recognize and honour “the unsung heroes of the nation who are doing excellent work in the field of disaster management.” It was felt that many organisations and individuals are working silently but persistently on mitigation and preparedness towards minimizing the impact of future disasters; and that there is a need to recognize their efforts towards alleviating human suffering caused by the disasters. 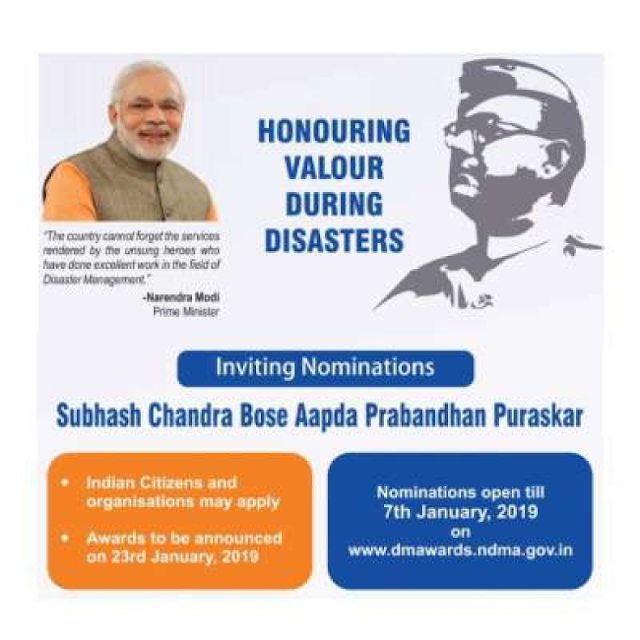 On these lines, the Government of India has invited nominations for the Subhash Chandra Bose Aapda Prabandhan Puraskar. There will be up to three awards. Both institutions and individuals are eligible for these awards. An institution and individual winner will receive a certificate and a cash prize of Rs. 51 lakhs and Rs. 5 lakhs respectively. An application by an institution does not debar any individual from that institution to apply for the award in his individual capacity. 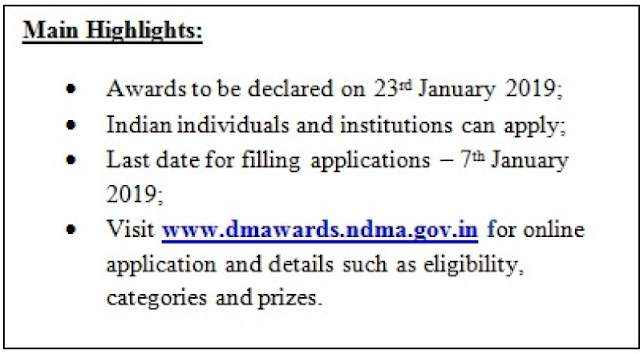 The applications shall be filed online on www.dmawards.ndma.gov.in and the last date for filing applications is 7th January 2019.